In a back alley in downtown Srinagar, the capital of India-controlled Kashmir, a string of words splashed on a wall reads: “Long Live Palestine”. Nearby, “Free Gaza” screams from a shutter on a store. Across a tiny gulley, graffiti on a sidewall has been scratched off. If you stare hard enough, the words “Free Kashmir” rise like an apparition. For many Muslims around the world, Palestine holds a special place in their political consciousness. Al-Aqsa Mosque, after all, is one of the most important sites in Islam. Those on the left – whether millennial radicals or grey-bearded Marxists – have also supported the Palestinian cause over the zealous imperialism of Zionist settler-colonialism, ethnic cleansing, displacement and war-mongering. Israel’s invasions of Gaza over the past decade have repeatedly fuelled protests in countries as diverse as South Africa, the UK and Malaysia. But in Muslim-majority, India-controlled Kashmir, the subjugation of Palestinians is a personal matter – a reminder of their own condition. 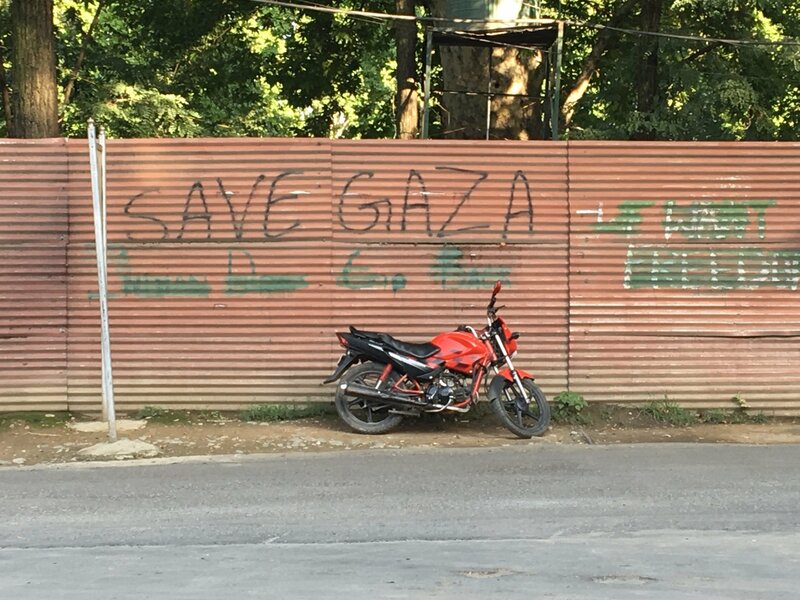 While the Indian state tries to remove all graffiti that references Kashmiri liberation from the walls and steel shutters, there is little attempt to remove the spray paint that spells “Free Gaza”. The state apparently thinks that pro-Palestinian slogans are inconsequential and uninspiring. Kashmiris have been among the first to organise and demonstrate. They emerge on the streets with banners, and seeing no difference between their overlords and Israeli soldiers, they throw stones at Indian troops. When the last Gaza offensive began in July 2014, Kashmiris took to the streets daily to protest against the Israeli bombardment. In one incident, Indian armed forces fired live ammunition at protesters in a district 60km from Srinagar, killing ninth-grader Suhail Ahmed. For decades, Kashmiris in Indian-controlled Kashmir have been demanding freedom, or at least the right to self-determination as promised by the 1948 UN Security Council Resolution 47. Kashmir has been claimed in full by both India and Pakistan since 1947. A de facto border separates the Indian-controlled from the Pakistani-controlled parts of Kashmir. Three out of the four wars fought between the two countries have been over the dispute. Since the armed resistance began in 1988, more than 70,000 people have been killed, and thousands more are unaccounted for through enforced disappearances. Today, with around 700,000 troops amid a population of 14 million, Kashmir is the most militarised place on earth. This is a society harassed by checkpoints and army convoys, terrorised by troops able to operate with impunity under the Armed Forces Special Powers Act, and mired in a legal malaise called the Public Safety Act that allows young boys to be picked up and held indefinitely without charge. This is not dissimilar to the Israeli policy of “administrative detention” that has seen thousands of Palestinians held indefinitely. For years, Indian forces have used lead-plated pellets as a method of “crowd control”. These have blinded 1,000 people and wounded 10,000 others, with injuries ranging from torn tissue to internal organ damage. 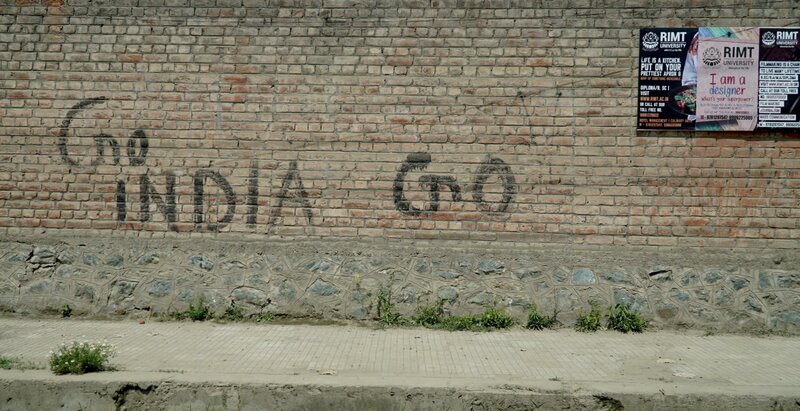 As if violence was not enough, the Indian state regularly disconnects the internet and telephone services to discourage grassroots organising and the dissemination of information, and to cut off Kashmiri people from the rest of the world. Though the strengthening of ties between India and Israel is a fairly recent phenomenon, they have rapidly developed an effective partnership based on strategic interests. India has repeatedly sent its police and special forces to Israel for training. Between 2013 and 2017, India was the largest importer of Israeli arms. Israeli Rafael’s Spice 2000 missiles as well as Heron drones reportedly played a significant role in India’s recent “surgical strike” in Pakistan on 26 February. Just days before the strike, India ordered 50 more drones in a deal worth $500m. Crucially, Israel continues to collaborate with India to ensure that Kashmiris remain a subjugated people. And while the occupations of Palestine and Kashmir are not identical – there are certainly differences – Israeli and Indian ambitions are not dissimilar. In some ways, they feed off each other. Israel has systematically ethnically cleansed Palestinians, taking over their homes, buying off resistance, quelling dissent, and appropriating elements of their culture – even cuisine – as part of a larger bid to remove the Palestinian footprint from these lands. As a result, Palestinians are essentially second-class non-citizens. In comparison, India, through a policy of “domestication” – or to use BJP leader Ram Madhav’s words, “instilling India” into Kashmiri Muslims – seeks to make Kashmiri Muslims relinquish their political identities and submit to the larger Indian project. They would then become “Indian Muslims”, who, by all measures of success and equity in Indian society, are second-class citizens. The endgame is to facilitate a demographic shift in Kashmir itself, bringing in more Hindus from India to settle into Kashmir. Then, there is the matter of language and manufacturing consent. Both Israel and India employ a sophisticated, securitised, statist language – parroted by their jingoistic media – that helps to legitimise the occupation, along with related human rights violations and crackdowns. The quick resort to Islamophobia is an easy sell to justify their actions. Just as Israel describes its invasions of Gaza as a “defence” against “radical Islamist” Hamas members, Indians are still able to invoke their international brands of “Gandhi” and “yoga” while unleashing ammunition into protests by Kashmiri youth, saying that they are Pakistan-sponsored terrorists or radical jihadists. It is a wilful use of language, the blind loyalty of an elite, and the disconnection of local and international media that allows both Palestinians and Kashmiris to be vilified at any given opportunity. Just as Israelis or Zionists intimidate academics, journalists and intellectuals who question Israeli policies, so too do the strong, often nationalistic Indian diaspora in media houses and schools around the planet attempt to suppress any discussion of Kashmir. Like Palestinians, many young Kashmiris, powerless in the face of state machinery, have resorted to stone-pelting. The fact that Indian authorities use disproportionate force – including burning down villages, homes and crops of those loosely acquainted with rebel fighters – is also conveniently ignored. Both Palestine and Kashmir have neighbours operating primarily on self-interest. If Palestine has Jordan and Egypt undermining its cause, Kashmir has Pakistan, which seeks little more than allegiance and a worthy alibi in India to deflect from the real and legitimate concerns of Kashmiris. Finally, it’s a matter of public sentiment. When it comes to the larger Israeli and Indian publics, the vulgarity of the occupation has stripped them of their humanity to the point that they cheer for death and war. Israelis famously picnicked on hilltops to watch as the bombs rain down on Gaza in 2014. This week, as Indian jets flew over Pakistani territory to kickstart war, Indian celebrities – including writers, actors, cricket stars, a former undersecretary at the UN, and a current UNICEF ambassador – cheered them on Twitter. This comes after Kashmiris in various Indian cities were beaten and intimidated by mobs who screamed “Dogs welcome but not Kashmiris”, following the attack on paramilitary forces on 14 February. The hue of “democracy” has given both India and Israel special gravitas and legitimacy; their supposed utility – India’s economic power and Israeli’s technological prowess – for the rest of the world has also granted them a certain immunity. Israel might still have its detractors, while India is still “a lesser evil”. But together, they are formidable. In the gulley in downtown Srinagar, where “Free Gaza” remains on the shutters and “Long Live Palestine” sits scribbled on a chipped front wall, another slogan, “India Go Home” is covered with black paint. But for Kashmiris, the message is one and the same. Hello, I want to stop getting notifications. Kindly let me know how to do that? First, make sure you’re logged in. Then visit the site you want to Unfollow and click the button that says Following in the bottom right-hand corner. You can also click Edit List in your Reader to display the list of blogs you follow. Find the blog you no longer wish to follow, then click the green word Following next to the name of the site to stop receiving notifications of new posts from that blog. Following Blogs for detail instructions, please. With such a truthful and heartfelt account of the plight of the Muslims of Kashmir the writer tends to betray the intent behind this op-ed by this one line. Perhaps he is not aware of the complex history of the dispute I would like to think however it must stand corrected and categorically corrected – If Pakistan did in fact seek to deflecct from the real and legitimate concern of Kashmiris it would not have followed one course since 1947 and so single mindedly and that is the people of Kashmir must be given the right to self determination that has been denied to them for 71 years despite UN Resolutions. So assuming India will be an ‘alibi’ in this is far from any logic.